10 Fun Wedding Games to make your guests play during your Indian pre-wedding functions! Wedding games add to the celebratory spirit of any function. Imagine what it would be like getting your mehndi done for 5 hours straight without any banter, music and loud laughs! Can’t even think of such a dull ceremony, right? To make all your pre-wedding functions interesting, I have listed down 10 Indian wedding games that you can play on your haldi, mehndi or even the cocktail party. I have added Indian marriage games for both the bride and the groom as well as guests of all ages. No one should be getting bored waiting for the food and drinks to come in during these pre-wedding functions, right? Read on, and tell me which ones do you love the most! This Indian wedding game, which is quite a norm in the west has started to take Indian weddings by storm. And to be honest, I am totally loving it! It is one of my favourite Indian wedding games that is played mostly on the sangeet or cocktail night when both the bride and the groom are a few cocktails down! The bride and groom are seated back-to-back in front of all the guests. The bride is supposed to hold one of her and one of her groom's shoes. The groom has to do the same. A member of the bridal entourage can be the host to ask the questions (downloadable picture below), and the couple has to answer simultaneously by holding up the shoe that matches with the answer. For eg: Who is older. If the bride is, then both the bride and the groom will raise the bride’s shoe! Simple, right? Though your guests won't be playing this fun wedding game, you can be sure to hear giggles and howls as you and your partner answer silly questions about each other! This Indian wedding game is perfect for all your guests to interact with each other. You can create a custom wheel of activities or let's call them mini-dares of sorts that can be spun throughout your cocktail party. You can include options like "Pick a Couple to Kiss," “Sing Your Favourite Song” "Show Us Your Dance Moves," and "Bride and Groom Kiss." Everyone loves hoola hoops. Especially children. If your mehndi or haldi is in an open lawn then you can make a hoola hoop corner and hopscotch tiles, where both children and adults can enjoy. How fun would it be to watch buaji hoola hoop after a few cocktails! This wedding game is perfect for all age groups. In this Indian wedding game all you have to do is make several big wedding rings of cardboard or steel and keep small goodies as gifts. You want a gift? Throw a ring around it and it’s yours! Simple, right? One of the most fun wedding games of all time, a Karaoke is perfect for your cocktail night. Sip those martinis, down those shots and sing to your heart’s content while others hoot and cheer along! Usually one of the most famous slumber party games, beer pong seems to be making a show in a lot of desi pre-wedding functions too. This fun wedding game is a win-win for both parties. When you win, you get to brag; but when you loose, you get to drink! This Indian wedding game is a trip down the nostalgia lane. All the kiddos, chacha’s and mama’s can give each other tough competition as they race kites and threaten to cut the other kites down! You sure as hell have played Jenga in a resto-bar or at house parties. This wedding game is a bigger version of that. Your jenga blocks get bigger and the dares written on them get all the guests to know each other. This fun wedding game is perfect to play on the mehndi ceremony. 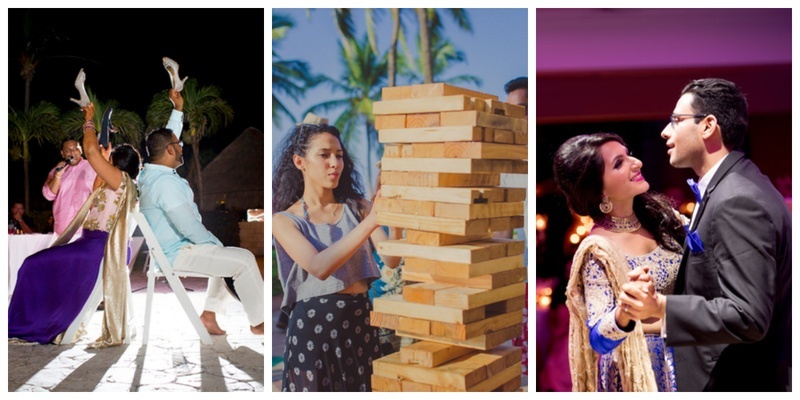 So which out of these wedding games are you planning to make your guests play at your Indian wedding?